Thank you to everyone who attended VECAN’s 11th Annual Community Energy & Climate Action Conference at Lake Morey on Saturday! Catch up below with VNRC’s latest news, and learn about opportunities to help us protect Vermont’s environment and communities. VECAN’s 11th Annual Community Energy & Climate Action Conference — With more than 300 people in attendance, this was our most successful conference yet! Find a re-cap below. An Urgent Call for Vermont Leadership on Climate Change — Along with other environmental and social service advocates, we put together a Vision for Climate Stability, Energy Independence, Equity and Affordability. Find it here. Vermont Voted for the Environment — Brian Shupe said it best in an op-ed at the Rutland Herald: One of the biggest winners in Vermont’s election was the environment. We’re looking forward to making progress with legislators on priorities ranging from clean water to climate change in the coming biennium. VNRC’s Recommendations for the Future of Act 250 — To inform the Commission on Act 250: The Next 50 Years’ final report (expected on Dec. 15), VNRC published its own position. Find our core recommendations here. Giving Tuesday at Zero Gravity — On Giving Tuesday, November 27, Zero Gravity Craft Brewery donated 100% of its taproom profits to VNRC. Thank you, Zero Gravity, and to those of you who gave directly to us in honor of this global celebration of charitable giving! Our Kids Ask: #WhatsYourPlan on Climate? — If you haven’t seen it yet, check out the video we produced about how climate change will affect our children. Since we last shared it, the video won 2nd place at the State Environmental Leaders Conference in the “Advocacy Video” category. Small Grants for Smart Growth — Applications are open for VNRC’s Small Grants for Smart Growth. Find out how to apply. Plus, see below for some updates about one of our recent awardees, the Rich Earth Institute in Brattleboro (wait until you see what they do). WEBINAR: What’s Happening with Land Subdivision in Vermont? — As part of the launch of VNRC’s new report/website that systematically tracks parcelization trends in Vermont, we delivered a webinar last month to planners and real estate professionals, to initiate them to the capabilities of the website’s data explorer. You’re welcome to view it, too. Find the webinar recording here. VNRC’s Kate McCarthy Among Vermont’s Rising Stars Class of 2018 — Our Sustainable Communities Program Director was named toVermont Business Magazine’s annual list of 40-under-40 doers and leaders. Congrats, Kate! Coming January 2019: Vermont Decarbonization Study — Governor Scott’s Climate Action Commission recommended an impartial analysis of economy-wide polices to reduce carbon pollution. While the Governor rejected such a study, the Legislature ran with it and funded an analysis now being undertaken under the nonpartisan Joint Fiscal Office (JFO). The results of the study — looking at potential policy pathways to reduce greenhouse gas emissions and spur economic development in Vermont — will be delivered in mid January. Learn more about the study here and stay tuned for updates. Millennials Are Taking Out “Insurance” Against Climate Change — If they can afford it, they’re buying land and building homes in places like Vermont, the Catskills, and Oregon, to preemptively escape a future of extreme weather. Read more at the New York Times. See more detail on select topics below. As always, we welcome your feedback and support. On Dec. 1, energy leaders, business innovators, and policy makers gathered for VECAN’s 11th annual conference in Fairlee, VT. Workshops included The Path to a Green Transportation System, Making Solar Accessible to Vermonters with Low Incomes, a 2019 Legislative Look Forward on Climate and Clean Energy, andCommunicating Beyond the Choir. Thank you to all who joined us! If you couldn’t make it, read the Valley News’ dispatch from the conference, and stay tuned for info about recorded sessions. To learn more about VECAN, visit vecan.net. VNRC, along with other environmental and social service advocates, developed A Vision for Climate Stability, Energy Independence, Equity and Affordability. Together, we call for the following, and more. And we acknowledge that we can’t make these big changes in Vermont without the help of our elected officials. View the document here. Plus, catch our video conference where we urge lawmakers to take state and local leadership on climate change in Vermont. 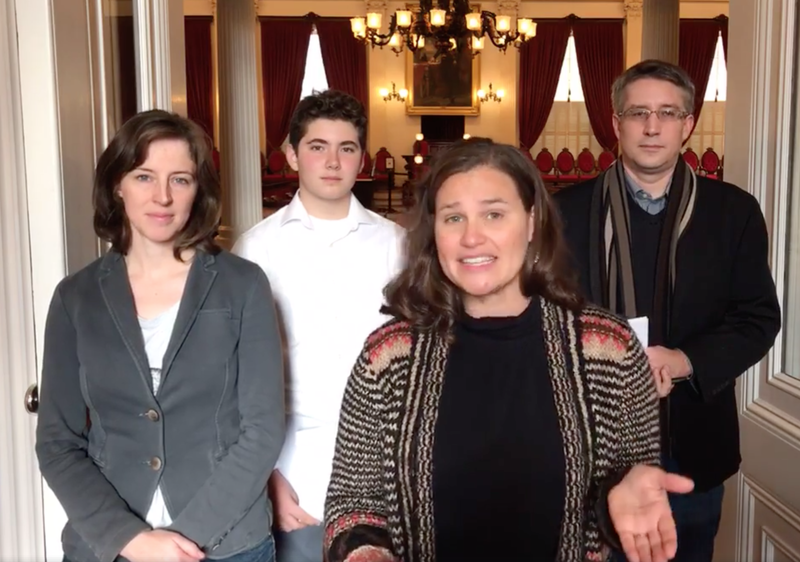 Featured are Lauren Hierl, Executive Director of Vermont Conservation Voters; Anne Watson, Mayor of Montpelier; Dan Barlow, Public Policy Manager of Vermont Businesses for Social Responsibility; and Gabriel Groveman, a student at Montpelier High School. This year, the Vermont Legislature created the Commission on Act 250: The Next 50 Years to work on modernizing Act 250, and established VNRC as an advisor to the Commission. To inform the Commission’s final report on its findings and next steps (influenced in part by public input), due out Dec. 15, we are pleased to share our own position on the many issues facing Act 250 in the next several decades: Core Recommendations to Strengthen the Environment, Communities, and the Act 250 Process. Find it here. Nothing to Flush At: Here’s What A Small Grant Can Do! Earlier this year, we awarded the Rich Earth Institute in Brattleboro with a Small Grant for Smart Growth to work on the nation’s first community-scale urine recycling program. You read that right: Rich Earth transforms waste into legally-approved fertilizer for agricultural use! 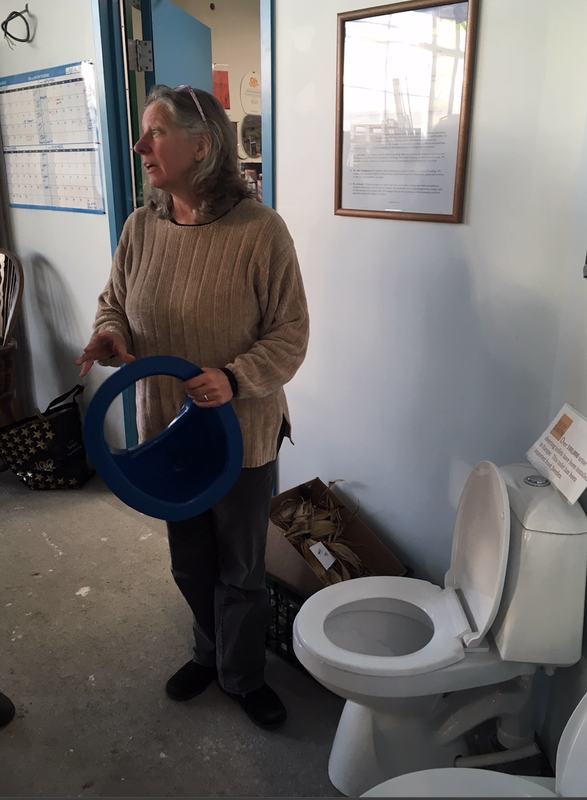 With their Small Grant, the organization is helping two southern Vermont villages, West Dummerston and Westminster West, find ways to incorporate this technology – and take pressure off their aging septic systems. Here’s a peek at what’s going on in an otherwise-unassuming warehouse in Brattleboro. If you have a project you think is eligible for a Small Grant, learn more and apply here. Kate McCarthy, our Sustainable Communities Program Director, was named to Vermont Business Magazine’s Rising Stars Class of 2018, a group of 40 winners under the age of 40 who were selected for their commitment to business growth, professional excellence, and involvement in their communities. Way to go, Kate! Pictured at the award ceremony are, from left to right (including friends and former staffers/Board members of VNRC): Betsy Hands, Kate McCarthy, Brian Shupe, Deb Markowitz, Kim Greenwood, and Beth Humstone. This entry was posted in Climate, Energy, Good Reads, Film Clips, etc. on December 7, 2018 by S.C. Intern.